Wilmington, NC - Two signature events promise one exciting winter weekend in Wilmington, North Carolina. Jazz fans, chocolate lovers and wine aficionados can feed their souls the first weekend of February when the North Carolina Jazz Festival (Feb. 2-4) and Wilmington Wine & Chocolate Festival (Feb. 3-5) return to Wilmington’s renowned, walkable river district. A winter tradition since 1980, the 37th Annual North Carolina Jazz Festival brings world-class artists to Wilmington, North Carolina for three nights of unforgettable performances. On February 2nd through 4th, more than a dozen traditional and swing jazz musicians will take the stage in an intimate setting at the Hilton Wilmington Riverside’s ballroom. The 2017 North Carolina Jazz Festival kicks off on Thursday night with a 3 ½-hour “Styles of Jazz” concert featuring world-renowned jazz singer, composer, actress and 6-time Grammy nominee Nnenna Freelon and her trio. Ms. Freelon, who has built a career on looking at standards from a non-traditional point of view, has toured with Ray Charles, Ellis Marasalis, Al Jarreau, George Benson, and others. Continuing the tradition of featuring a style of jazz different from the festival styles, Wilmington’s own Sea Pans will also perform on opening night. Sea Pans is comprised of a group of local musicians whose style evokes the “flavor” of Trinidad. Founder and Wilmington native, Vince Stout, meticulously handcrafts and tunes steel barrels to create authentic versions of steel drums (Pans). The evening will come to a rousing close with Professor Cunningham’s Traditional Jazz Jam. A stellar lineup of All-Star musicians distinguishes the N.C. Jazz Festival as one of the largest traditional jazz festivals in the Southeast. Friday and Saturday evening concerts feature the All-Stars in a traditional cabaret-style presentation of seven sets with different leaders. This year’s All-Star artists include: Kevin Bales and Rossano Sportiello (piano); Jim Fryer and Dion Tucker (trombone); Herman Burney and Katie Thiroux (bass); Jonathan Russell (violin); Nate Najar (guitar); Randy Reinhart and Bruce Harris (trumpet); Chuck Redd (drums and vibes); Adrian Cunningham and Anita Thomas (reeds and vocals); and Marion Felder (drums). Other highlights include workshops, master classes, and a Patron’s brunch and jam with the All-Stars. Events take place at the Hilton Wilmington Riverside (301 N. Water Street, Wilmington). Admission charge. For N.C. Jazz Festival tickets and details, call 910-793-1111 or visit www.ncjazzfestival.com. Tickets are available online via the festival website and for purchase at Audio Lab, 5732 Oleander Dr., Wilmington. For hotel reservations and festival rates, contact Hilton Wilmington Riverside: 910-763-5900; www.wilmingtonhilton.com. Less than a block away, the Wilmington Wine and Chocolate Festival tempts the palate with fine wine and decadent chocolates at the Coastline Event Center (503 Nutt Street, Wilmington). Wine and chocolate connoisseurs can sample delectable regional wineries, chocolatiers, specialty foods and artisans on Friday evening, and during the day on Saturday and Sunday. A Friday night gala-style Grand Tasting (7:00 p.m.-10:00 p.m.) kicks off with live music, heavy hors d’oeuvres (by Catering Thyme) and a fine art exhibit. Jazz saxophonist Benny Hill and his quartet will entertain with smooth and jazzy tunes while wine and chocolate purveyors tantalize with tastings. Next door, the Riverview Comedy and Craft Beer Lounge (8:00 p.m.) will feature up-and-coming comedian Daniel Butler, whose unique blend of Southern-fried, cynical observations, and high energy persona provide an unforgettable evening of entertainment. Wilmington’s own Broomtail Craft Brewery will provide craft beer in the Riverview Comedy & Craft Beer Lounge. A European-style wine and chocolate marketplace on Saturday (11:00 a.m. – 6:00 p.m.) and Sunday (12:00 p.m. – 4:00 p.m.) features more than 50 fine vintners, chocolatiers, bakers, specialty food purveyors, artists and musicians. Marketplace diversions include food demonstrations by Chef Sam Lawler of Catering Thyme and other culinary and wine experts. There’s also a Kids’ Korner with art and activities. Saturday’s entertainment lineup features local musicians. Admission charge benefits the New Hanover County Senior Center’s programs. Grand Tasting tickets are based on availability. Saturday and Sunday marketplace tickets are good for one day only. Discounts for children (ages 6-12)/seniors (60+)/military. Group rates available. For details, schedule, advance tickets and partner hotels, call 910-742-0120 or www.wilmingtonwineandchocolatefestival.com. 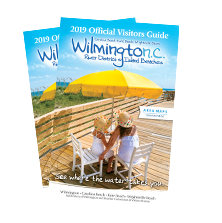 City + Beaches: Between sets and sips, visitors can enjoy Wilmington’s alluring 1.75-mile Riverwalk with more than 200 shops, restaurants, and attractions. Prefer an ocean view? The island beaches of Carolina Beach, Kure Beach and Wrightsville Beach are just a few minutes’ drive from the historic river district. For a free 2017 Official Visitors Guide, call 1-866-266-969. For seasonal highlights and special offers, visit www.wilmingtonandbeaches.com/seasonal-page.